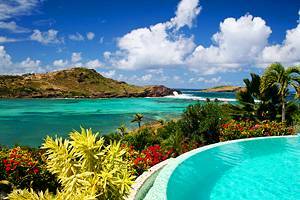 St Barts has a reputation as a glamorous destination known for attracting the rich and famous. The island not only has beautiful white sand beaches and natural attractions, but designer shops selling all kinds of luxury items, galleries, and quality French cuisine. There are no large scale resorts but many small size boutique hotels that cater to tourists from primarily North America, as well as Europe and other parts of the world. 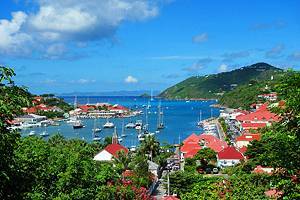 Gustavia is the capital city and where much of the action is centered. This is where visitors come for fine dining and high end shopping, although there is also a local market. Although there are few historical sites in the city, there are remains of several forts in the area, including Fort Gustav and Fort Karl. To learn a little local history stop by the Wall House Museum, set in a restored historic building. For those looking to hit the beach there are plenty of options on St Barts. Some of the most beautiful and popular swimming beaches are Grande Saline Beach, St Jeans Bay Beach, Flamands Beach, Governor's Beach, Grand Cul de Sac Beach, and Corossol Beach. Surfers will want to check out Lorient Beach, Caye Beach, or Toiny Beach. There are numerous other beaches, many of which are popular mooring locations and good snorkeling spots. Around the island are a number of small towns and villages worth visiting. Located in the north, Lorient is the oldest settlement on the island. The town of Corossol is known for straw hats and crafts, and is also home to the Ingenu Magras' InterOceans Museum with an extensive shell collection. St Jean is a small beach town and shopping destination on the island. Beyond the towns, some of the other principle attractions are the snorkeling and diving, with reefs and wrecks in calm waters, fishing, boating, and depending on the time of year, festivals. The St Barts Music Festival has grown into a two week event, held each January, with performances by international musicians and groups, held at local churches and community centers in the evenings.